FireFighter® PG30 is a factory pre-mixed, non-toxic antifreeze designed specifically for use in wet fire sprinkler systems. FireFighter PG30 is a propylene glycol-based fluid which is suitable in all approved types of pipe, except CPVC and galvanized. 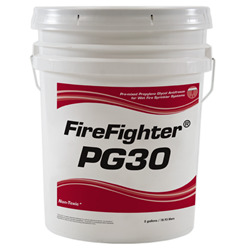 FireFighter PG30 is factory pre-mixed to NFPA guidelines of a 30% propylene glycol solution.